The Harvey Mudd College Magazine is the College’s publication of news, features and alumni notes produced by the Office of Communications and Marketing. It is mailed three times per year to alumni, parents, donors and friends of the College. The mission of the magazine is to foster ties with alumni and friends of the College by featuring achievements of alumni, students, faculty and staff, with particular emphasis on the societal impact of engineering, science and mathematics. 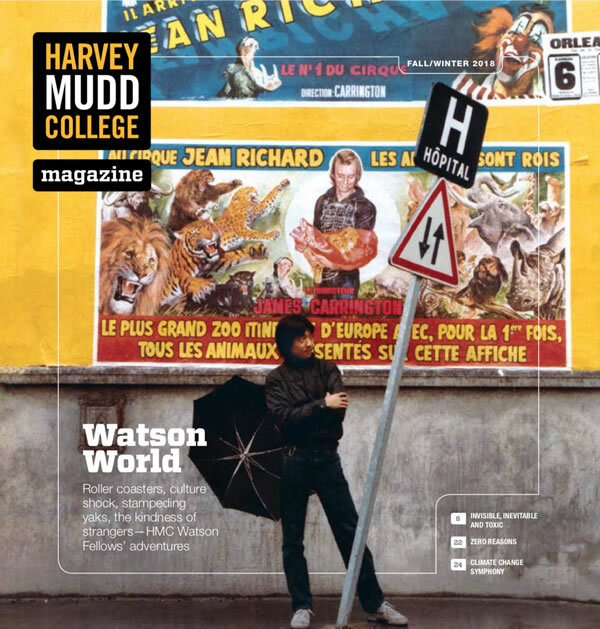 Harvey Mudd College Magazine is distributed free. To be added to the mailing list (hard copy or online), contact communications@hmc.edu. Editorial offices: 301 Platt Blvd., Claremont, CA 91711; telephone 909.607.7928. Unless otherwise indicated, text may be reprinted without permission. Please credit Harvey Mudd College. Share ideas and comments by contacting the editorial team at communications@hmc.edu.